A crime scene. A murder. A mystery. The most important person on the scene? The forensic scientist. And yet the intricate details of criminal forensics work remain a mystery to most of us. In a book that is by turns fascinating and chilling, Nigel McCrery leads readers around the world and through two centuries to relate the history of forensics in accessible and entertaining prose. He introduces such colorful characters as Dr. Edmond Locard, the "French Sherlock Holmes"; and Edward Heinrich, the "Wizard of Berkeley," who is credited with having solved over 2,000 crimes. All the major areas of forensics, including ballistics, fiber analysis, and genetic fingerprinting, are explained with reference to the landmark cases in which they proved their worth, allowing readers to solve the crimes along with the experts. 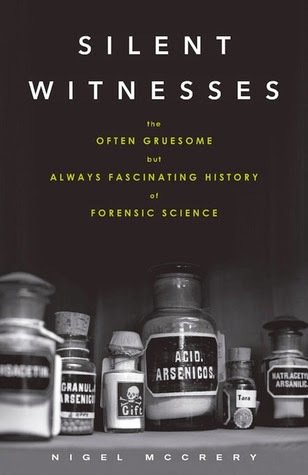 Whether detailing the identification of a severed head preserved in gin, the first murder solved because of a fingerprint, or the first time DNA evidence was used to bring a sadistic killer to justice, Silent Witnesses provides dramatic practical demonstrations of scientific principles and demonstrates a truth known by all forensic scientists: people still have a story to tell long after they are dead.